The booking forms are in the Journal so what are you waiting for? Get yourselves booked in and be assured of the best social weekend of the National calendar! If you would like an electronic version of the booking form (so you don't have to rip a page from your Journal) then please click on the PDF logo below to download the form then print it off, fill it in and send it (along with your payment) to Amanda at the address on the foot of the form. Don't forget to include your order for a t-shirt on the form as we will buy some extras to sell at the event but to keep costs down it'll only be a few - if you pre-order then you are guaranteed to get the size you want! You can send a cheque or pay by electronic means (bank transfer or PayPal) if you would rather - just contact Amanda for details. After a leisurely breakfast it will be time to pack up and head home as we have to vacate the site by lunchtime (so no lunch will be available on site this day). If your journey home isn't too long then why not take the scenic route out of East Anglia and visit some sites in Norfolk, Cambridgeshire or Essex? Don't forget, all food and drink purchased on site will have to be paid for using the special stamp-cards. You purchase these cards using cash or your plastic card from the college staff at the bar then the value of any purchase is stamped off the card until the card is completely stamped. So you may find you need to carry a couple of these cards but don't worry because any credit left on the cards at the end of the weekend can be cashed in before you leave. Write your name and membership number on the card and then even if you lose it someone will get it back to you. When planning your weekend please do remember that we have to vacate the site by Monday lunchtime (that means all rooms vacated so they can clear them and the camp site clear of tents and vehicles). Ride outs will meet up at 9:30 am for a quick briefing and then set off at a relaxed pace. Rides will be around 80 miles with coffee and lunch stops. 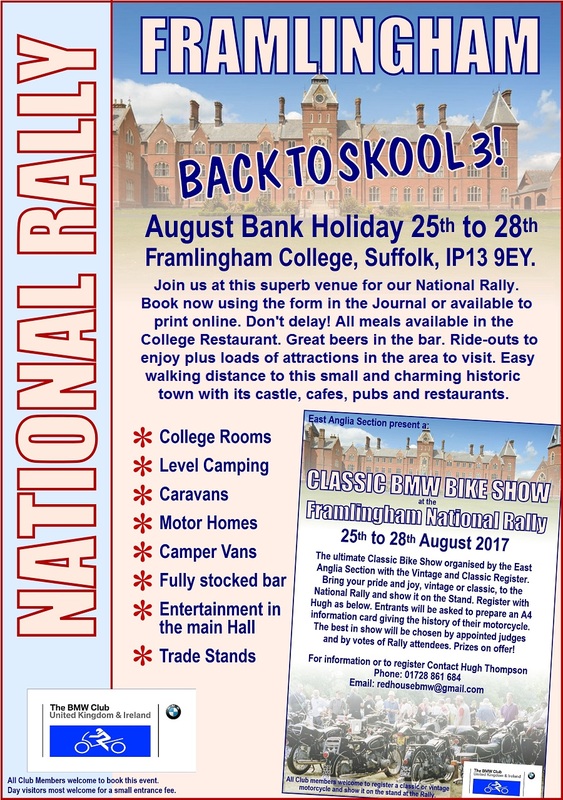 One ride is for vintage and classic bikes and will be a bit shorter, ending with a stop at Andy Tiernan Classics in Framlingham. Full details of other rides are to follow, but one includes a tour of St Peter's Brewery, Bungay, and another takes you through some of the many scenic villages in Suffolk. The BMW Club is the trading name of The B.M.W. Motorcycle Club Ltd. A company limited by guarantee, Registered in England, registration Number 4261129.